During Sunday breakfast which for every Turk is the main five hours of the week, my partner suddenly turned towards me: “You know, nobody is safe, Turkey is not safe for anyone anymore. People like us are not safe.” The sense of not belonging to your own country had slowly infiltrated several people’s mood, and the fear that many ethnic and sexual minorities had felt for ages was becoming part of the more general middle-class sentiment too. It was a sort of calm, yet melancholically perfect summary of some of the moods in Turkey as confused people witnessed the events unfold in the news, on social media, through various streams and live feeds, personal stories and telephone calls to friends and relatives. The footage has varied from official talking heads of politicians promising to “exterminate anyone against us” (as the Turkish Prime Minister vowed in his live address) to shaky clips of different events across the cities, of people chasing other people without really being able to tell why and who, of tanks and military personnel, hands up and consequently beaten and later the numerous images of celebrations of a country that is, again, covered in the red-white Turkish flag. The attempted coup day is promised to become a national holiday, a day of democracy. And yet, many are more conflicted about the celebrations. Not because they supported the coup – far from it, as all the opposition parties too voiced their disapproval – but because fearing that the country will be far from safe that is the business-as-usual state of things when it comes to the normalised atmosphere of violence that is at times physical, at times mental. The events over the past days and especially the coup night of Friday turning to Saturday were a properly frightening spectacle. Especially in Ankara and Istanbul, people were for the first time set in the midst of what was nothing short of a war scene. Besides a visual description of events, many will remember it by how it sounded. The soundscape of a coup was the low flying F-16, at times even breaking windows of flats. It included the helicopter buzz, the sirens and then the calls from the massive network of mosques not only for prayer (outside the usual Muslim prayer times) but to go the streets to stop the coup. President Erdogan’s message reached quickly the loyal supporters who flooded the streets. Suddenly rescuing democracy (even using corporate social media platforms) was ok. The next day, everything was calmer. While the mosques’ call continued throughout the day, you could again hear birds singing and life seemed almost idyllic with the usual sort of background you would expect to hear on a Saturday morning: Turkish families’ breakfast noises, tea glasses clinking, casual street corner chats. A lot had however changed. Much of the events that followed can be seen as a direct consequence of the spectacle that took lots of lives that today are visible in the pictures of coffins and funerals. Judges fired, threats of revenge, even mentioning the option of a death penalty while closing alternative media outlets like Medyascope, Gazeteport, Karşı Gazete, Aktif Haber, etc. After the spectacle, the slow, quiet violence of the everyday resumed. During my morning trip to buy breakfast cheese I also happened to witness the all too usual scene of a Turkish husband shouting violently to his wife, with physical threats. Men kill more women than many of the legitimate institutions of violence have done the past years, and this is not a consequence of the current government or the AK Party but a feature that runs across the social life and has done so for a long time. The post-coup attempt day became filled with other sorts of anecdotal stories that are the more mundane side to the story than warplanes above the Istanbul sky. And many fear this is the increasingly normalised side of life in Turkey: religious people attacking partygoers who were drinking alcohol, intolerance towards ethnic and religious minorities and a general tightening of the implicit rules of what is morally acceptable behaviour or clothing. After the 6000 arrests that range far beyond the military personnel directly involved, more will be on the way. As the case of Turkey has for years proven, anyone can be branded as a terrorist. The cleansing of universities and other institutions has already been happening for a while. After the failed coup, these operations intensify with the opportunity to get rid of anyone undesired, and now there is a further perceived mandate to remove unwanted opponents of the government, and to replace them with loyalists. Luckily the violent coup is over and the everyday continues, but for many it has not been safe so far anyway. 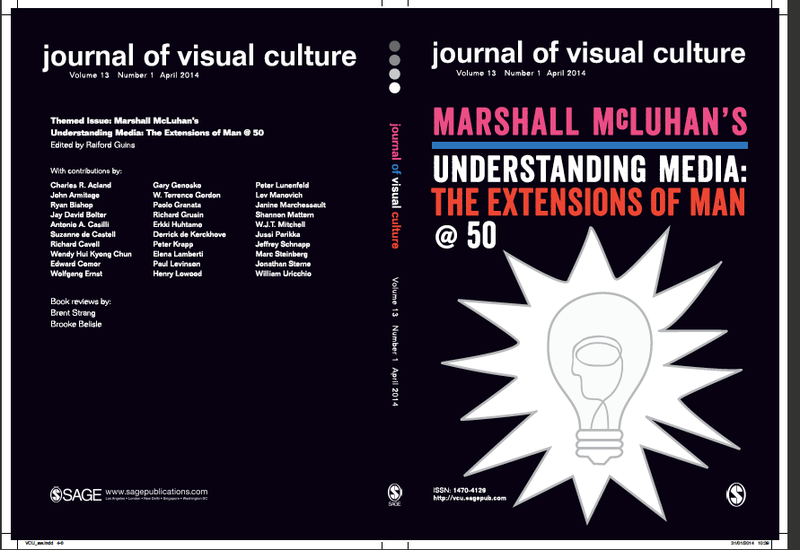 The new issue of Journal of Visual Culture is a celebration of Marshall McLuhan. The Canadian media theorist’s classic book, Understanding Media: Extensions of Man, was published 50 years ago and editor Raiford Guins asked several writers to remember the book with a very short text. The texts in the issue are reactions, variations, recollections and remediations of McLuhan and his themes. My own text (pp.91-93) was written in Istanbul: a short variation on McLuhan, urban space, weaponization and media environments. I was carrying a fresh copy of Understanding Media with me on Istiklal Street, Istanbul, alongside people in gas masks and police in riot gear. It no longer felt relevant to write about past experiences of engaging with the book or to reflect on McLuhan as a forerunner of media archaeology. This time I did not want to write about ‘anti-McLuhan’ minor histories of media technologies: the ones that do not take media as extensions of Man but as extensions of the animal – for instance, insects – as their starting point (Parikka, 2010). Travelling from the Anatolian side of Istanbul with a ferry to Kabatas, the chapter on ‘Weapons’ seemed to strike a chord. Extensive tear-gassing and police operations had turned some parts of the city into something unrecognizable, like in a state of emergency. The events at Gezi Park and its occupation grew from an environmental protest to widespread demonstrations across Turkey. Besides the environmental context, the demonstrations were against the authoritarian measures of the state: excessive tear-gassing, random arrests, and persecution of journalists, spokesmen and – women. In the light of McLuhan one starts to think about the various cultural techniques and media contexts of the events in Istanbul. The usual suspects – social media such as Twitter – were quickly acknowledged as important platforms of knowledge sharing but also for a circulation of the affects of outrage, disbelief and defiance. Online media services seemed to quickly open up a new forum for political discussion, crystallized in the inventive use of hashtags as forms of software literacy. When the mainstream media were airing documentaries on penguins, tweets from Gezi were distributing a whole different set of images about what was happening to public space in Turkey. 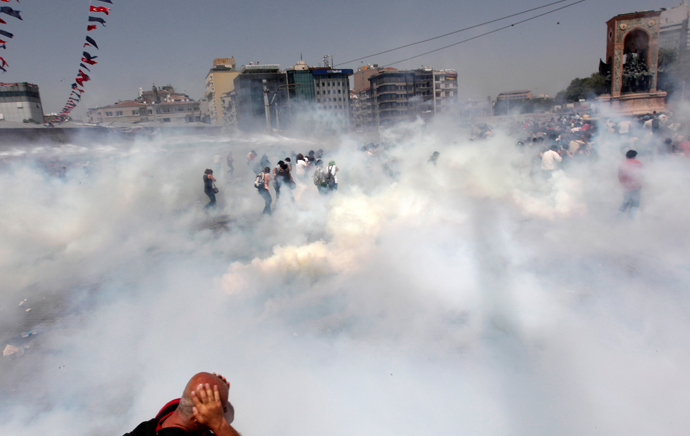 Tear gas produced its own eerie atmosphere on the streets of Istanbul, which had quickly transformed into policed spaces accessible only with gas masks: a denial of the breath (Sloterdijk, 2009). Walking up from Kabatas port towards Taksim, one could observe this sort of expansion of the meaning of media. This is where McLuhan is at his best. Media are not only about cinema, television, and radio. We start to see the world as media in itself: roads and surfaces, windows and squares become ways of mediating our relation to time and space. Walls are painted with ad hoc slogans; sprayed with images and words in order to mark a territory but also to leave a trace for the next passerby. 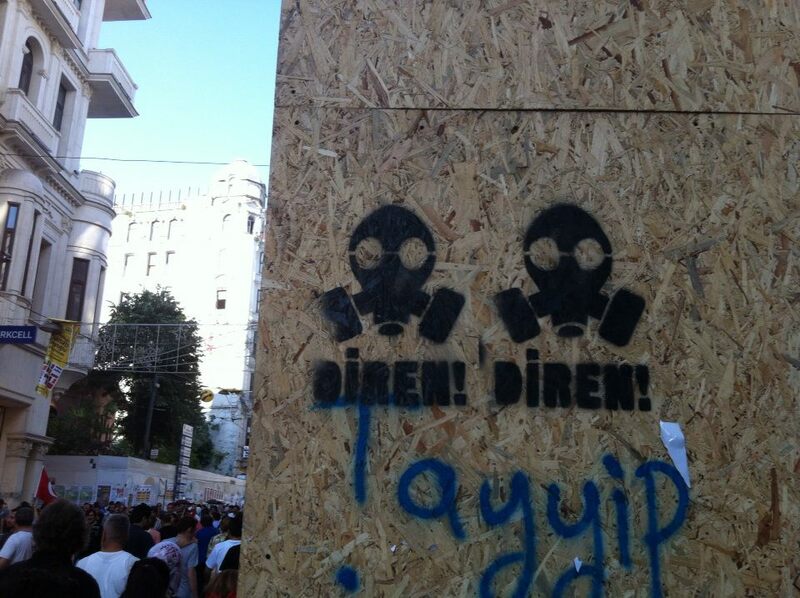 The huge letters ‘GAZDOGAN’ referred to the prime minister Tayyip Erdogan and the tear-gas tactics of the government. 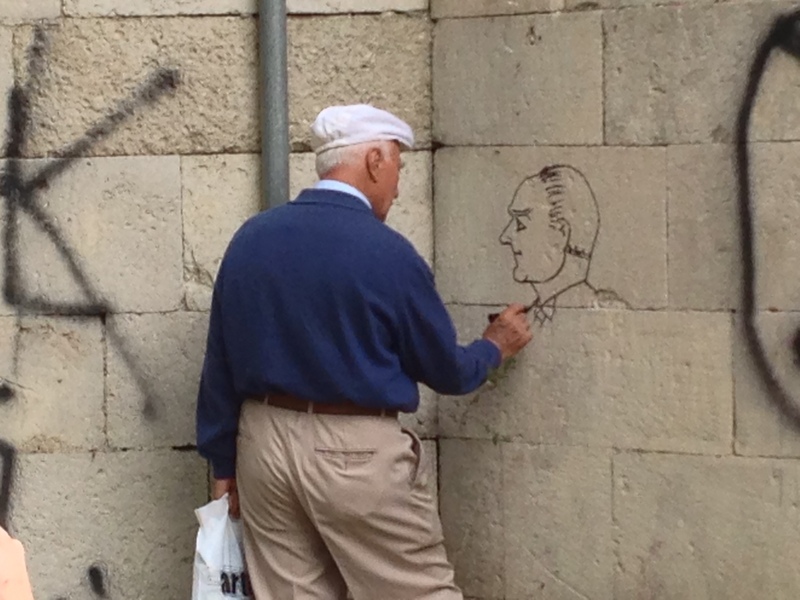 Not only Facebook walls, but the city walls became quick and dirty media surfaces: I was struck by a photograph of an older Turkish man, in his 70s, drawing the face of Mustafa Kemal Atatürk on the wall. Then he walked to another street corner and drew another face of Mustafa Kemal. It was Kemal who introduced the Latin-based alphabet to Turkey in the 1920s and 1930s: in addition to a Europeanization of Turkey as a way to detach from the writing systems of Arabic and Persian origins, it was also ‘modernization’ in relation to the media technologies of telegraphy and the printing press to which the discrete nature was better suited. The alphabet escorts both a geopolitical orientation as well as entertains a relation to various technological changes not without an effect on our perceptual dispositions. Atatürk persists as a symbolic reference point for various nationalist protestors: his political heritage nature is remediated as content of chants and demands of political nature. The visual space is not only about figures of Atatürk but also more carnevalistic: penguins (as a reference to mainstream media censorship) are suddenly as popular a source of remix and memes as cats usually are in internet culture. Political expression takes the form of artistic expression: ‘the artist must ever play and experiment with new means of arranging experience, even though the majority of his audience may prefer to remain fixed in their old perceptual attitudes’, writes McLuhan (2001: 276) in the chapter on the telegraph. The online and the city are paired up in this production of visual resistance, but let’s not get too focused on content. One is struck by McLuhan’s reminder that ‘the city, itself, is traditionally a military weapon, and is a collective shield or armor plate, an extension of the castle of our very skins’ (p. 374). This idea is informative of the role of security, war and the city, but it also misses the point about the past years of security regimes which turn the city into an autoimmune disorder: the inhabitants become the targets of police forces, in relation to global events such as G8/G20 meetings (Renzi and Elmer, 2012), as well as such events as those in Turkish cities. But this autoimmune disease of the city does not extend the skin, but attacks the respiratory organs of people with tear gas. It burns the skin when the chemicals are infused with the water in water cannons. McLuhan is constantly useful as a reminder that media are everywhere, and are able to lock our senses in particular ways – perhaps not in the way that there would be always one dominating media episteme, such as literacy (cf. McLuhan, 2001: 373), but more temporarily as a form of attention management. Instead, there is a constant contestation as to the forms of media power: mainstream television might be producing visions of coldness, like documentaries about penguins, but that feeds back to remediations that expand the time and space of what we mean by media itself. McLuhan M (2001) Understanding Media. London: Routledge. Parikka J (2010) Insect Media: An Archaeology of Animals and Technology. Minneapolis: University of Minnesota Press. Sloterdijk P (2009) Terror from the Air, trans. A Patton and S Corcoran. Los Angeles: Semiotext(e). After the humans had left, what stayed were the ruins of buildings. Time had passed for the place to reach this silence; the graffiti filled walls, beer cans, glass from broken bottles stayed after as such monuments. There was something else too, in the air. A radio signal lost, a ghost signal. It is completely silent for human ears. 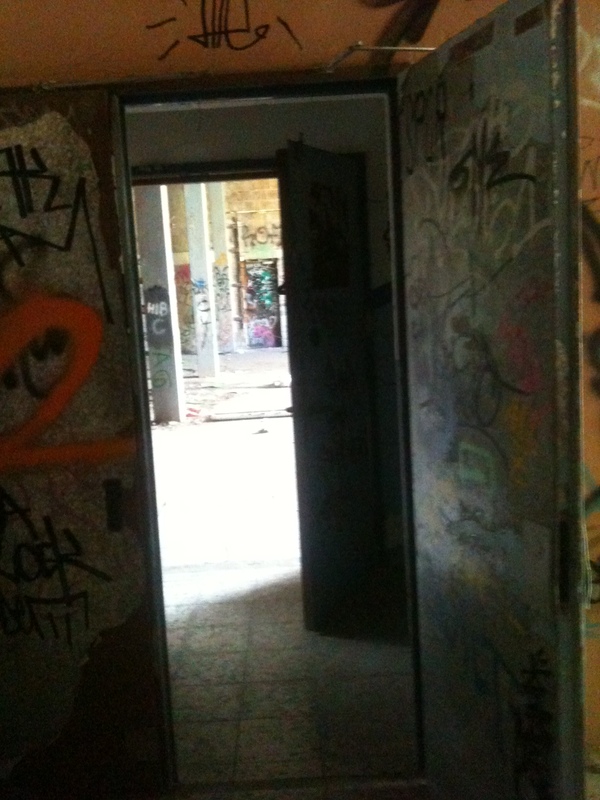 Only the buildings echo, concrete walls. 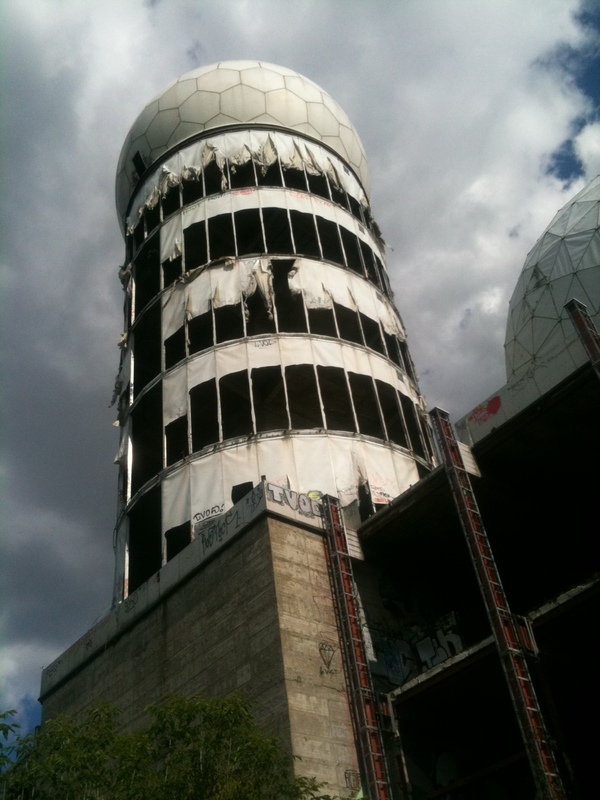 The listening post, a Cold War relic. It had that Soviet science fiction quality about it, even if it exactly tried to listen to signals of communist origin. The ferris wheel in nearby Zehlendorf acted as an amplifier of its signals. 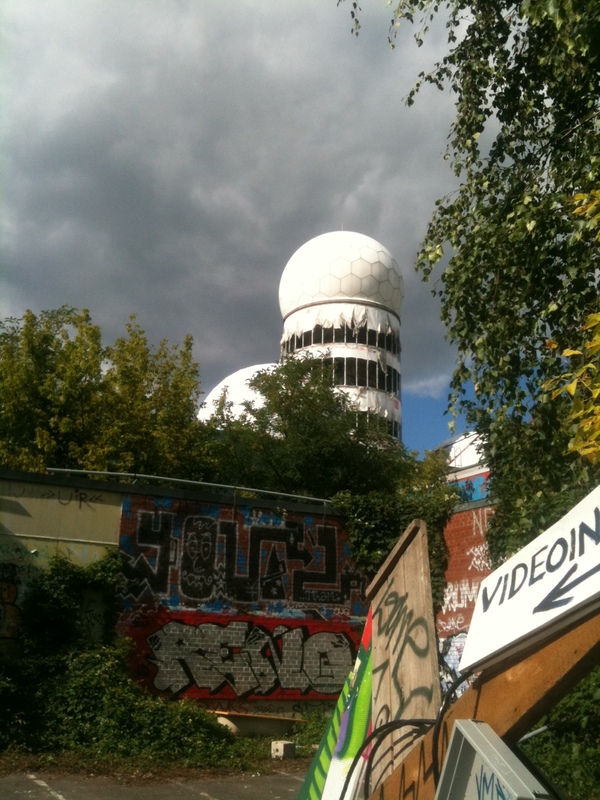 If Cold War started in Potsdam, then it primarily took place in non-places — like on this hill. Itself a monument, built from the rubble from the bombings during the 1940s War. 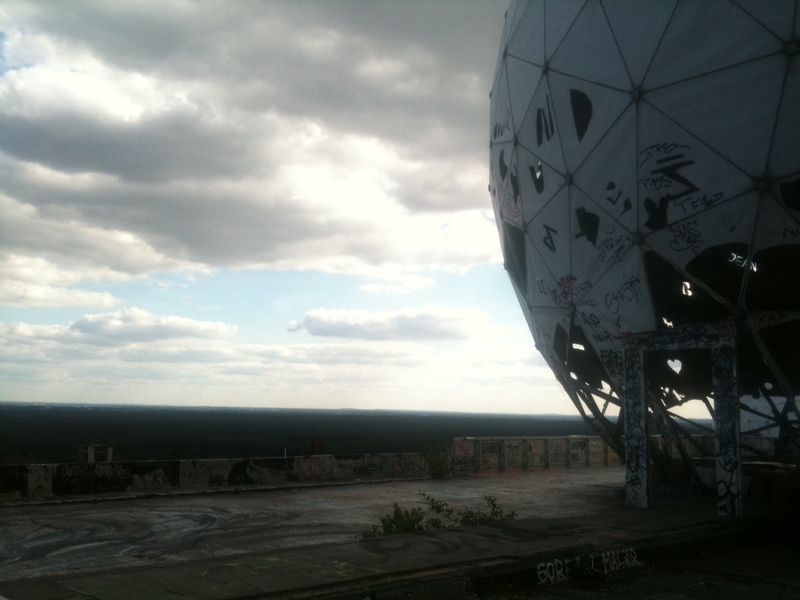 And yet, non-place is hardly the term when you look at the concrete and now weirdly past-utopian looking listening domes. They stand out. You can imagine this as a setting for a Thomas Pynchon novel. But it is a non-place because probably nothing much happened. Signal traffic, capture, listening. Procedures of monitoring, reporting, and then it starts again. Signals don’t occupy a place anyway, just a time and a pattern of regularity. 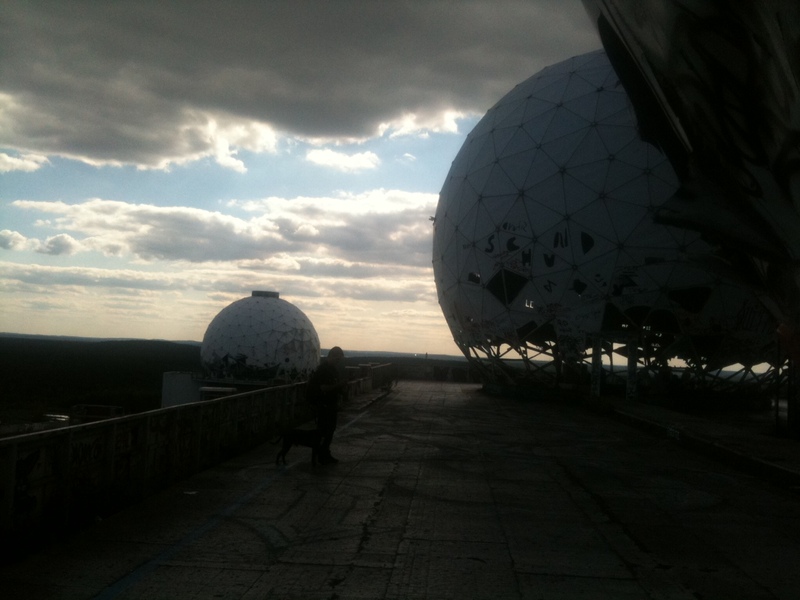 And yet this place is one of those iconic, media theoretically significant places: Bletchley Park, Peenemünde, etc. It starts to make sense when you think of it as a network of such posts. 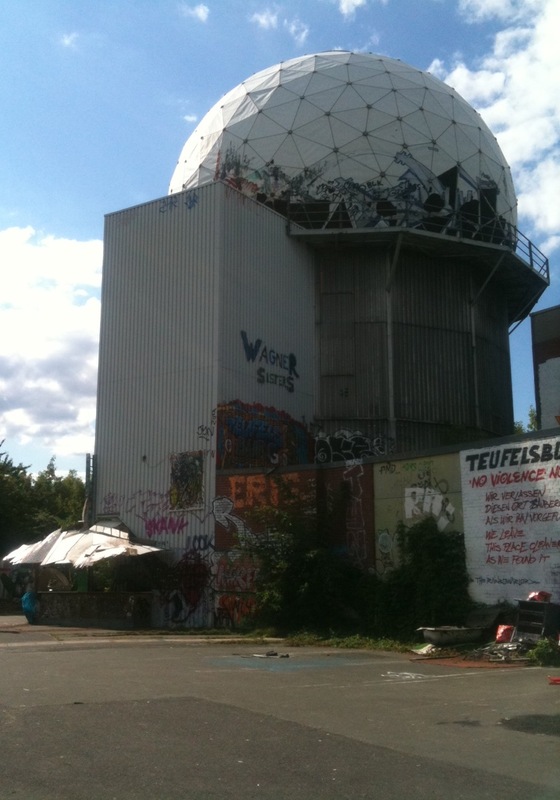 ECHELON – characterised by a European Parliament report much later:”If U.K.U.S.A states operate listening stations in the relevant regions of the earth, in principle they can intercept all telephone, fax and data traffic transmitted via such satellites.” There are no borders to national security. It feels natural to imagine this place without any humans, just like mathematical communication theory works best without them. Only the ghostly shouts and echoes that ensue. Ping, echo request. We are today kicking off our new research centre seminar series with John Phillips (National University of Singapore) and his talk “Seeing Things” – which promises to address Bernard Stiegler, military technologies and critical theory. And next week Thursday, continuing with Esther Milne with Siegert, not Stiegler! Seminar Series: 3 November 2011, 5 pm at seminar room 8-9. Intimacy, affect and image are always intertwined at the level of technology. The practices of mail-art, for example, are enabled by the material conditions of the postal exchange. In turn, the economies of this exchange are underpinned by the dance between absence and presence: writing a letter signals the absence of the recipient and, simultaneously, aims to bridge the gap between writer and recipient. This paper traces the production of presence across nineteenth century postal networks in order to make some preliminary remarks about twenty first century platforms of social media, such as Twitter. In particular it explores the emergence of contemporary patterns of ‘public privacy’ through their socio-technical historical settings. Postcard media offers one such site. As Bernhard Siegert and Jacques Derrida have demonstrated, the postcard operates as a liminal figure for the reformulation of public and private communication. ‘Public Privacy’ describes the ways in which subjects use the public signifying systems of social media to produce images of love, desire and pain. Yet such rhetorical strategies are not unique to distributed digital platforms. After all, the eighteenth century epistolary network, often called ‘The Republic of Letters’, was responsible for reconfiguring the public and private domain. Through an exploration of mail-art practice, this paper identifies the postal principle of Twitter to challenge recent claims for the ‘death of privacy’. BIO: Dr Esther Milne is Deputy Head of Humanities, Arts and Social Sciences at Swinburne University, Melbourne, Australia. She researches in the areas of celebrity production within legislative and cultural contexts; and the history of networked postal communication systems. Her recent book, Letters, Postcards, Email: Technologies of Presence, is published by Routledge.